Get bean a-cookin’ and fruit & vegetable a-juicin’ this weekend. Beans and legumes are the stars of this Saturday’s cooking class in Alabang while this Sunday’s juice and smoothie workshop in Makati will be all over fruits and vegetables. One of the things I’m so lucky (and grateful!) to have is an education in alternative cooking. With this in hand, I hope to teach and inspire people to make more healthful food choices. While other culinary schools focused on the usual suspects to get flavor — meat, dairy, butter, white sugar — my rockstar culinary school focused on the other suspects — miso paste, coconut milk, olive oil, etc. 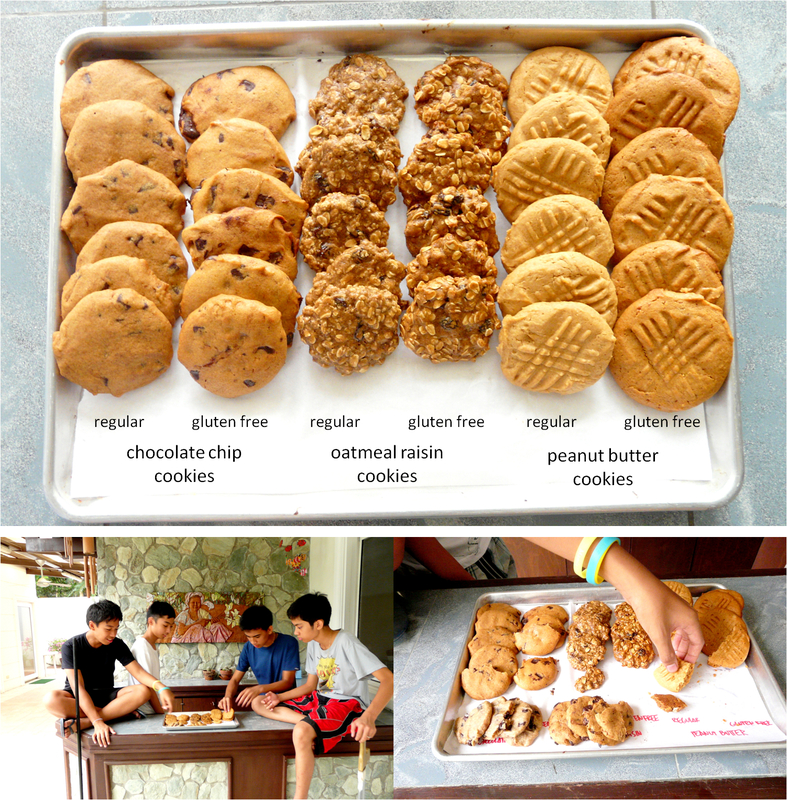 The Chocolate Chip Cookie Experiment was about converting crappola conventional baked sweets into healthier versions that rocked our taste buds. My class split up into pairs and converted cookies, brownies, and cupcakes. Moral of the (baking) story? Deliciousness needn’t be sacrificed when you take dairy and eggs out of the equation. You are only limited by your culinary imagination. And I swear I’m not lying when I declare that the final cookie tasted pretty sinful. 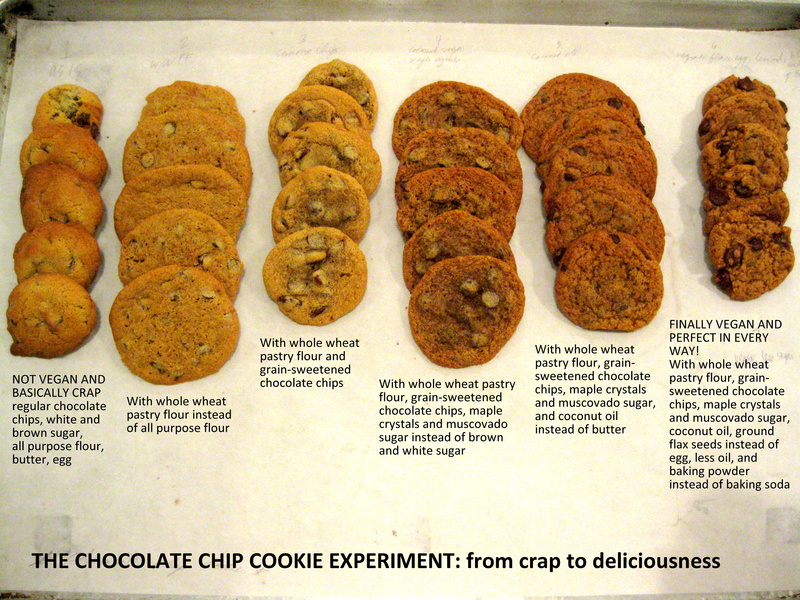 These cookies were rigorously tested by a panel of judges with palates of the conventional, non-vegan cookie persuasion. All cookies were vegan and made with coconut sugar: one version made with regular flour, the other with gluten-free flour (conventional oats technically have been ‘contaminated’ with gluten so these ones were at least wheat-free). Verdict? These passed with flying colors and the gluten free ones actually had a better crumb. They didn’t taste hippie, either! Watch out for a cookie baking class in the very near future. If you are partial to certain cookie flavors that you adamantly feel must be included in the repertoire, leave a message. Interested in gluten free baking? Leave a message! hi i’m a diabetic but i really love pastries and cakes. i hope you can share your sugar free or low sugar pastries and cakes recipes. ty and continue your efforts toward good healthy eating.